Fort Lee was then a part of the Ridgefield Township and there was no fire protection services in this section of the township. participating were from Fort Lee’s pioneer families: Schlupp, McNally, Beyer, Semmindger, Hanover, Kimball, Lang, Schlosser, Hunt and Hoyle. These and so many others were the first to band together in Fort Lee to fight the perils and ravages of fire so that the homes of their families and neighbors might be safe. William Kalisher, John A. Lang, Lames McNally, Arthur Kimball, Joseph Schlosser, Jr., Jacob Beyer, Guido Semmindinger, William Hoyle, Thomas A. McNally, Charles A. Hundt, Jr., Andrew Roos, Gustave Schulmann and L.H. Van Sycle. A meeting was held at the Schlosser Hall and was called to order by Chairman Pro Tem Morris Hanover. A motion was made and carried that there will be a 50 cent membership fee charged to the following new members: Henry Benecke, William Walder, George Linder, Charles A Hunt, Sr., J.H. Guntzer, Charles E. Richter, Phillip Hook, John H. Brandt. Joseph Schlosser, Sr., Charles Hummel, Michael McNally, John Hartmann and George Roof. A motion was made and carried that the fire company be formally and permanently organized with the following officers: Morris Hanover - President, George Linder - Vice President, Phillip Beyer - Secretary, John A Brandt - Treasurer, Arthur Kimble - Sgt.-at-Arms, Charles A. Hundt, Sr. - Temporary Fire Chief. A motion was made and carried that the new fire company be known as "Fort Lee Fire Protection Association No. 1".Charles A. Hundt, Sr. was elected as Chief of Department; George Linder as Assistant Chief; Louis Schlupp as Foreman and Jacob Beyer as Assistant Foreman. (Foreman and Assistant Foreman were later changed to Captain and Lieutenant). Even in the days of the late 1800’s, possibly even more so than today, financial backing would be necessary. This problem was tackled by the townspeople. The newly-formed fire department solicited subscriptions in order to raise the necessary finances. At its initial fund drive $400.00 was raised and an additional $500.00 was received at the first Annual Fireman’s Ball. It was with this $900.00 that the people of Fort Lee acquired their first piece of fire apparatus on August 28, 1888 - a horse drawn combination pumper for $875.00. Now with a piece of apparatus to work with, the volunteers had to have some way of transmitting alarms. It was now that an unexpected occurrence took place. In the center of the village of Fort Lee stood another pioneer mark, the Holy Angels Convent, and it was this dedicated group of nuns that became Fort Lee’s first fire alarm dispatchers. At a report of a fire, one of the good sisters would ring the bell in the tower of the convent to summon the volunteers. 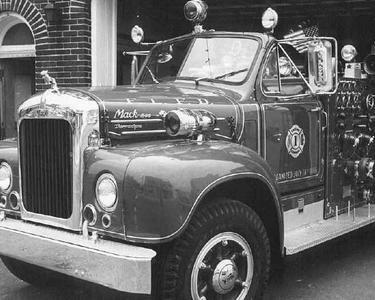 During this time, the fire wagon was temporarily housed in the barn of Oscar Buckheister.The fire district ran from the Hudson River westward to the crest of the Leonia Hill and from Main Street north to the Demoras house north of the present Fort Lee-Englewood Cliffs border. 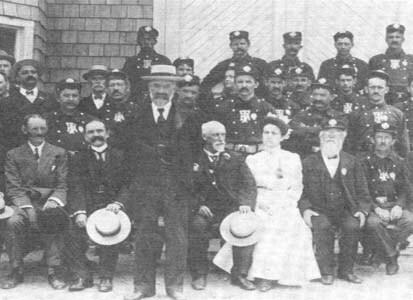 The first chief officers were elected: Chief of Department was Charles A. Hundt, Sr. and Assistant Chief George Linder. The first company officers were elected: Foreman Louis Schlupp, Assistant Foreman Jacob Beyer with the company being directed administratively by Morris Hanover and J. Fletcher Burdette. As the years went on Fire Protective Association No. 1 conferred with the water company to construct system of cisterns, which was done to further afford the citizens more efficient protection. On January 8th, Charles A. Hundt, Sr. was re-elected as Chief of Department. On February 25th, a committee of three firefighters - J.F. Burdett, A. Kimble and James McNally was formed to find a site for building afirehouse. On August 13th, Mrs. Brossnahan offered to sell a piece of property to the association for $450.00. The property was purchased and the first fire house was built for a little over $1,050.00. On December 25th, the association moved into its new firehouse, which is at its present day location on Main Street. 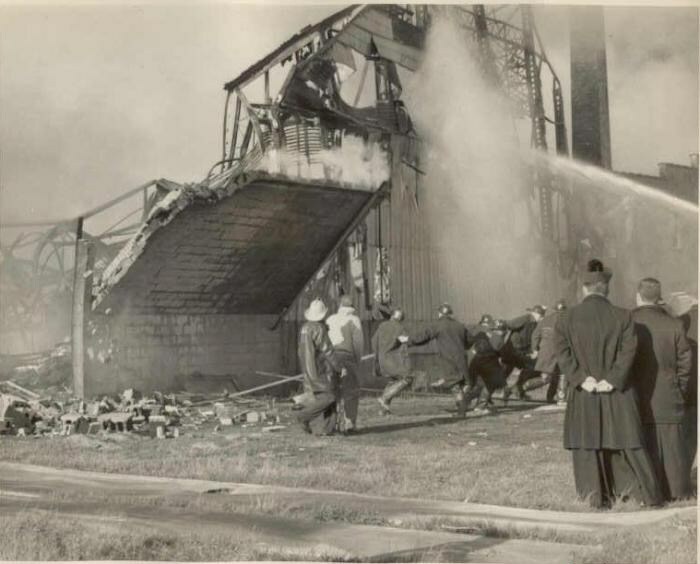 The building was a 22ft by 40ft, two story wood frame structure with a peaked roof and a 15ft. bell tower, The cornerstone for the firehouse was laid with the names of all of the members. The current firehouse was built in 1929. 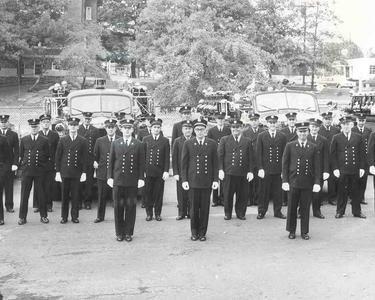 The Firemen’s Relief Association was formed with Morris Hanover, Phillip Beyer and Ed Fitzgerald at the reins. The president of the Fire Protection Association No. 1 had the honor of informing the membership that the $800.00 mortgage on its building was canceled. Fire Protective Association No. 1 went under the jurisdiction of the Ridgefield Township. They meet in Brannigan’s barn on the night of July 9, 1900 and notified the Ridgefield Township of their intentions to initiate a fire company. They gained recognition from the township and proceeded with their plans. 1901 ​Their first fire house was located in Mrs. Dempsey’s blacksmith shop. A year later, in 1901, many of the early movie stars living in what is now Coytesville ran a benefit performance at Buckheister’s Park in Fort Lee. Among those performing were Maurice Barrymore and Charles Drew. 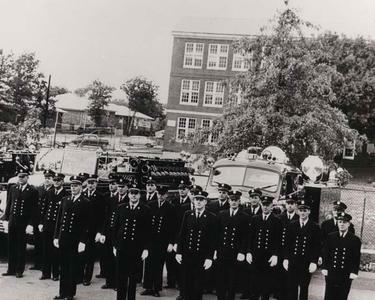 With the proceeds of the benefit, land was purchased on Washington Avenue and a fire house and community hall was constructed. The volunteers also acquire a hose reel and a two-wheeled ladder truck which carried two small ladders, a few lengths of hose and numerous leather buckets. Hook & Ladder Company no.3 is located at 557 Main Street. 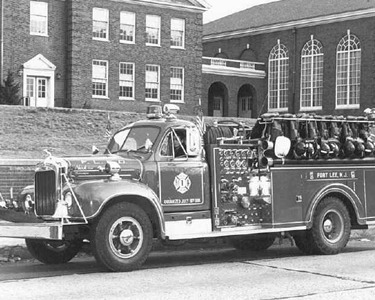 In the Taylorville section of Fort Lee, as West Fort Lee was then known, the need for fire protection had been growing rapidly. 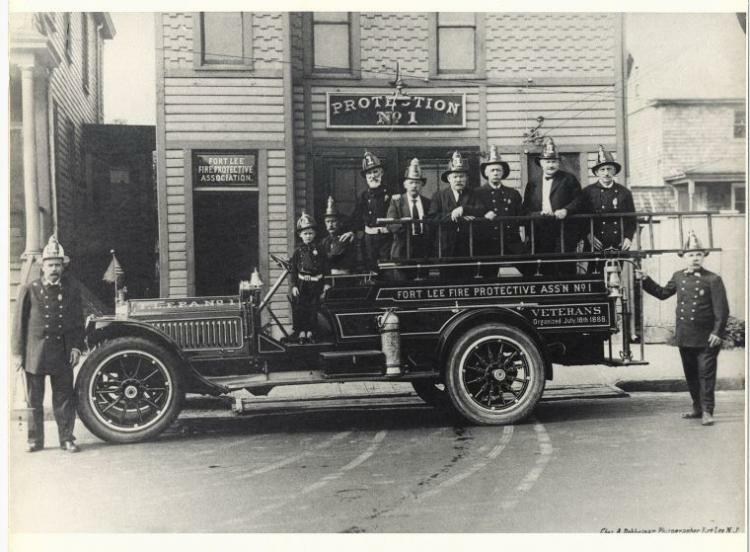 A group of citizens met in Getche’s Hall on Hofley’s Lane and decided to form a fire company - Protection Company No. 3. As the meeting progressed, President Charles Goebel readsa list of the members present and asked if they will pledge to serve the community in time of need and so another fire company was born. For their first piece of apparatus the town fathers gave them a four- wheeled hose wagon. Palisade Engine Company no.4 is located at 420 Brinkerhoff Avenue. The southern portion of the borough, known as the Palisade section, was a heavily wooded tract of land in which many expensive homes were built. As the area was being developed their need for fire protection was becoming evident. So on the night of January 9, 1906 a group of public-spirited citizens gathered together and formed Palisade Company No. 4. At first the unit was but as an auxiliary company to both Fort Lee and Palisades Park, but later the factions in the company split with some going to Fort Lee and the rest going to Palisades Park. When Fort Lee took jurisdiction of the land west of Abbott Boulevard to the present border, the company was reunited.